On the island of Zakynthos, a grandmother receives generous blindness benefits—even though she can see perfectly well. On a moonlit night in May 1941, a month after Nazi Germany’s invasion of Greece, two students scaled the cliffs of the Acropolis of Athens, waded through shadows cast by the Parthenon, and shimmied up a flagpole in order to yank down the flag of the Third Reich. Of course, this insane and heroic act had only symbolic significance. Within months, Greeks endured what is known as the “Great Famine,” villages across Greece were torched, and most patches of organized resistance were quickly, brutally snuffed. By 1945 the great Jewish city of Thessaloniki would have almost all traces of its Sephardic identity erased, with most of its Jews sent to Auschwitz. Nor did the suffering of the Greeks end when the war did, since a bloody civil war followed: Right-wing collaborators fought Communist-leaning intellectuals to fill the void left by the Germans, with world powers lined up behind both sides to claim their share of the spoils. This is all very recent history, especially by Greek standards. Manolis Glezos, one of the students who stole the Nazi flag that night, is alive and well in his 90s. He’s now an outspoken public figure and a member of Syriza, the political party that swept the Greek elections in January. They did so thanks to their campaign promise to resist another German occupation (this one financial), and the Greek people have supported Syriza’s defiant stance, voting a resounding Oxi (“No”) in this past weekend’s momentous referendum. “There are places where history is inescapable, like a highway accident—places where geography provokes history,” said Joseph Brodsky. Economics alone cannot explain what has happened in Greece, just as it fails to express the anguish of the Greek people, who a decade ago enjoyed the kind of prosperity taken for granted in most parts of Europe, and of whom a new generation now experiences the hunger and desperation they’d only heard about from their grandparents. As a Greek-American boy, James Angelos spent summers in his grandmother’s village in Greece. That village was Corinth, which he remembers as a “humble and largely agrarian” backwater that also happened to be situated across the road from the ruins of an ancient city. Push back the soil from any patch of Greek land and you’re likely to reveal something. Mr. Angelos’s timely book, “The Full Catastrophe,” does just that in famous and less well-known sites across the country. Mr. Angelos, a former Journal correspondent, travels through Greece as a journalist first, and a native son second, to conduct a mostly unpleasant archaeology. By way of background, however, he first tackles the pervasive issues of disability and pension fraud, rampant tax evasion, and public worker job protections. These are the very problems that Greece’s European lenders sought to remedy through a series of supposedly helpful but also punitive and ineptly administered reforms. Mr. Angelos dismantles the facile narrative accepted by many in the eurozone, in which hardworking Germans must clean up a mess made by their lazy and “Oriental” southern neighbors. But he is equally tenacious when it comes to exposing the misconduct of Greek politicians, not to mention the country’s corrupt system of career tenure and its, well, truly Byzantine bureaucracy. Mr. Angelos’s book allows us to see how these problems play out, sometimes farcically, in the lives of actual people. There’s a cranky grandmother on the island of Zakynthos who receives generous blindness benefits even though she can see perfectly well. There’s the arrogant former prime minister who accepted millions of euros in bribes to buy useless submarines on behalf of the Greek government. There are Bangladeshi migrants who sell knockoff cigarettes to help newly impoverished Greeks keep up their chain-smoking. There’s also the flag-stealing war hero Mr. Glezos, whose argument that Germany should forgive Greek debt in exchange for long overdue war reparations is by turns compelling and specious. In later chapters, Mr. Angelos turns his gaze toward even more distressing developments. First, there’s the migrant crisis. An already struggling Greece now has its borders and islands overrun with refugees, especially those fleeing Syria and Afghanistan. Second, there’s the rise of Golden Dawn, a neo-Nazi party whose blatantly racist arguments for Hellenic superiority are shockingly echoed by many figures in the Orthodox Church. There are a few points of hope in “The Full Catastrophe.” There’s Father Prokopios, for example, a priest who dares speak out against the anti-immigrant vigilante mobs in Athens. And the book’s single most flattering portrait is of Yiannis Boutaris, the tattooed, wine-making, freethinking mayor of Thessaloniki, who courts Turkish tourism, refuses to kowtow to the church and publicly acknowledges the crucial role of Jews in the city’s history. Mr. Angelos completed his book at the end of 2014, so only his hastily written epilogue addresses the recent elections and the Syriza government’s negotiations with the Troika. But the story of the catastrophe is far from over. 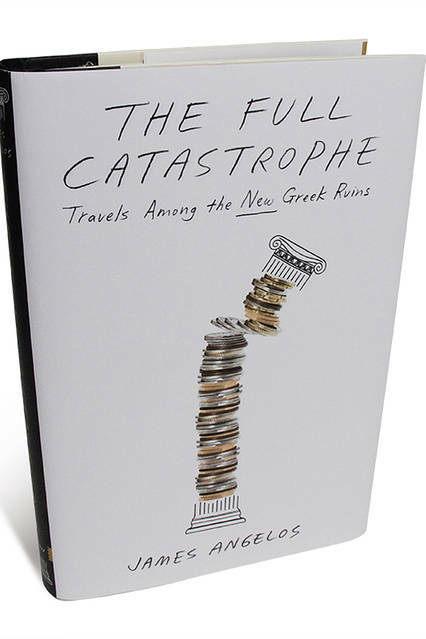 By the time we arrive at the end of the book, it’s hard not to cringe at Mr. Angelos’s heartfelt, if belated, footnote: “Greece, of course, is a beautiful place, and if you haven’t been there you should visit.” I doubt the Greek National Tourist Board will be offering him a paycheck anytime soon. Still, it would be hard to find a better guide to the “new” Greek ruins. Mr. Bakken is author of the memoir “Honey, Olives, Octopus: Adventures at the Greek Table.” He teaches at Allegheny College. Posted on July 7, 2015, in Postings. Bookmark the permalink. Leave a comment.